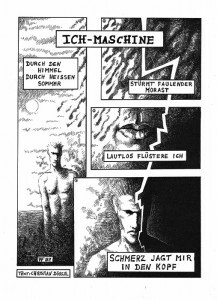 The then planned book, a collaboration with the the musician and writer Christian Dörge , was never realized. Some of the drawings were printed in fanzines, most of them remained unpublished. To get the white lines on black background I drew the negative images with black ink on white paper and inverted the scanned drawings with Photoshop (back in the 90’s I used a laser copying machine to achieve the same result). 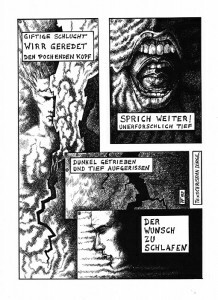 Two more drawings for a Text by Christian Dörge hier. Psyche are a Canadian dark synth-pop band, now based in Germany. In the 80’s they became well known with “Unveiling the Secret” and other songs. Psyche are centered on singer Darrin C. Huss who has been the only constant member, with various line-ups including his brother Stephen Huss, later followed by other musicians. Darrin used to live in Kassel for a while where I got to know him in 1993. The collaboration for the album Intimacy was of huge importance for me because, amongst other reasons, I knew and loved the album Unveiling the Secret since the late 80’s. To draw the illustrations, I had the lyrics, but I don’t remember if I knew the music yet. 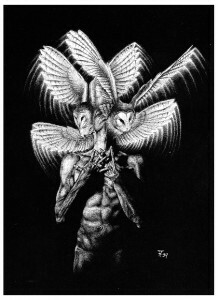 In 2000 three drawings were re-used for the specially-compiled Canadian release Misguided Angels. ‘Mein Vater, mein Vater, jetzt faßt er mich an! 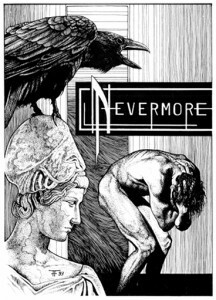 The illustrations for „Erlkönig“ and „The Raven“ were private comissions; they were published in the literary magazine Dandelion No. 3 in 1993. In the early 90s I wrote round about ten poems to be published in fanzines, usually combined with a drawing. They are not so much deeply-felt expressions of emotion as exercises in constructing proper sonetts, quite symbolist and a little bit cheesy. wie ein Bild von fremder Hand. Nacht im Kopf. Ein Traum vom Fliegen. was vom Tod getrennt ihn hat. dringt durch alle Poren. Sanftes Glühen makelloser Haut. dumpfer Trieb erhebt sich, überflutet jede Gegenwehr. dargeboten, wartend auf den dunklen Kuss, den letzten. über meine Lippen, die vom Lebensfluss benetzten. 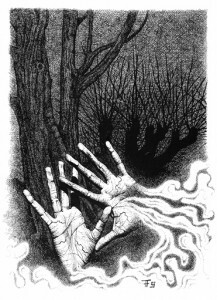 More illustrations for poems by Christian Dörge here.